We've established that tithing is expressing the life of Christ in us. Here we apply the principles of the increase of tithing on our understanding in order to see how our tithe grows in Christ. Tithing in Christ does not involve a representative tenth, for we have pass the shadows and we are at the reality. We do not express a tenth of the Christ in us but we express as mush Christ as we can. The more we grow the more of Christ we are able to express. At each stage of our growth we pour out as much Christ as we can. And as we offer up the Christ in us God gives us more grace to express more of Christ, this is how we grow in our tithing. "Bring all the tithes into the storehouse so there will be enough food in my Temple. If you do,” says the Lord of Heaven’s Armies, “I will open the windows of heaven for you. I will pour out a blessing so great you won’t have enough room to take it in! Try it! Put me to the test! Your crops will be abundant, for I will guard them from insects and disease. Your grapes will not fall from the vine before they are ripe,” says the Lord of Heaven’s Armies. “Then all nations will call you blessed, for your land will be such a delight,” says the Lord of Heaven’s Armies." (Mal 3:10-12). If only we understand these verses in the light of the New Covenant. It is such a blessed Scripture, it is the way out of a sinful life, it is the way to glory. Oh! Such glory that would make the world gather around us in wonder and awe of the beauty of God in the midst of His people. It is the way of increasing glory through romance. Our goal is to be like the Son in every way. To live like Jesus lived, to be able to do the things he did and even more. The process of getting to this goal is tithing. We must not denial God His tithe. He had put Christ in us and we must offer the tithe. 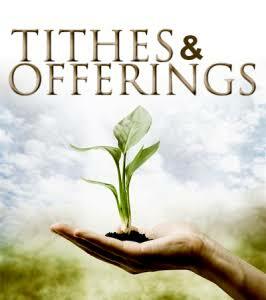 The reason why Christians are so poor (spiritually poor of the riches of Christ) is because we don't know how to tithe. We've refuse to express Christ in us yet we cry that darkness is overtaking us. We hid that beautiful Christ in us and we wonder why our life is such a mess. We hold back God's hands and invite the devourer. Our Christian life becomes so shallow and ugly making the world see no beauty in Christianity. We struggle with our lives as Christians and it is because we've refuse to tithe. Our focus have been on other things. We've been to busy with our many theologies and doctrines, our criticism and schism, our rituals and ceremony and all the church routine. As such we couldn't focus on practically expressing Christ. Oh, that Christians may know the importance of living the life of Christ. How mush emphasis have God put on this one thing yet we prove to be so blind. This is all that matters, this is the essence of the body. A body that can't express the person is dead yet the Church refuses to express Christ, no wonder there is so much deadness among us. We refuse to give life a chance and we are so focus insisting that we must pay a tenth of our income as tithe. So distracted are we that we lose focus on what really matters. All our theological argument and all our doctrinal correctness where has it taken us to? That we may see that we must pay our tithe but not in the way we use to but in the way it ought to. Christ must reign, he must be the focal of the Church. The Church must be structure in a way that provokes and ensures consistence and growth in our expression of Christ. Let the world see Christ in every believer, let Jesus walk on earth once more but through a larger body. Then we would see the glory of God coming upon us in such mighty waves. This topic belongs to a series, below is the rest of the series.